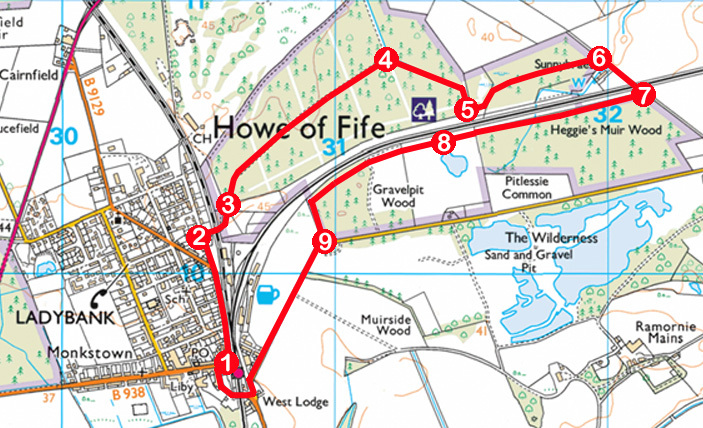 After earlier enjoying wanders through Heatherhall Wood, Edens Muir and Monkstown Wood, to the west, I returned to explore a trio of Forestry Commission plantations on the eastern side of town. South Annsmuir, Heggie’s Muir Wood and Gravelpit Wood lie across the main Edinburgh to Perth railway line but, a short walk north from Ladybank Station, just off Golf Street, there is a level crossing complete with red and green lights offering passage across the tracks. Bearing left past pony paddocks and an information board, the path crosses a band of heathland to enter South Annsmuir Wood at a Forestry Commission sign. Proceeding between this and a bench opposite, a broad trail leads through tall, slender Scots pines. The way curves gently right before cutting a straight line through the forest which was planted out in the 1940s and is home to red squirrels, great spotted and green woodpeckers and bats. During the Second World War, the plantations around Ladybank were a vital source of fuel for local people and, to the north of South Annsmuir, hidden amongst the trees, Camp Number 77, established as a Territorial Army training base in 1939, held German and Italian prisoners of war between 1945-48. Today a caravan park occupies the site, although traces of the camp remain and there is a commemorative stone. I passed through a couple of crossroads before reaching a T-junction where, ignoring a narrower trail branching right, I swung right on the main track, following it to the southern edge of the plantation where, beyond a gorse-covered mound, a strip of grassland lies between the trees and the railway line to Dundee. The former gravel put pond. Parallel to the permanent way, a path weaves east through pines planted in the 1970s to Sunnybraes where a grassy track bordering farmland passes the steading sheds to reach the second level crossing of the day. Unlike the one at Golf Street, this one does not have lights so, taking care to ensure there were no trains coming from either direction, I crossed swiftly then forked right into Heggie’s Muir Wood. Wartime pillbox in Gravelpit Wood. Various trails roam through the forest here but I stuck with the path running alongside the railway and, after crossing a stout wooden footbridge, briefly left the trees to explore a rush-lined pond, nature slowly reclaiming the site of a former sand and gravel quarry. 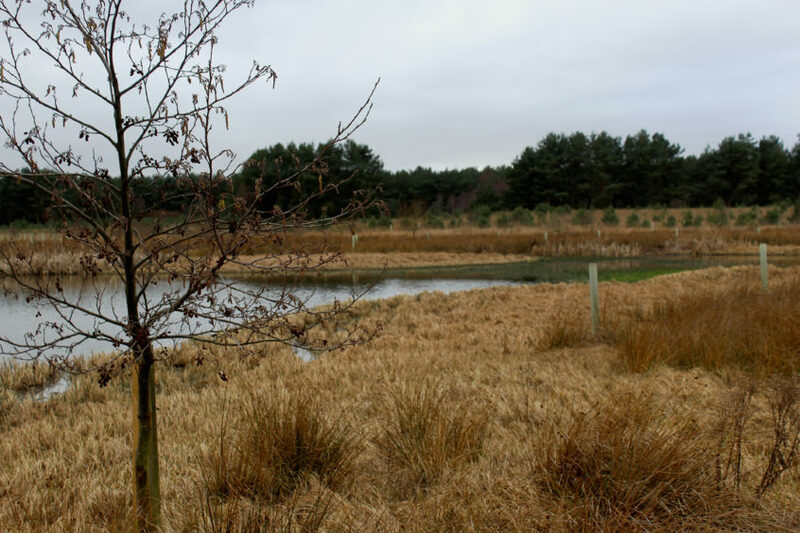 Flanked by fenced enclosures of young trees, a trail loops round the water, offering a short optional detour before returning to the route which continues by the railway, passing a wee wartime bunker. The well-preserved brick-built pillbox originally lay on the Fife Stop Line, a string of defensive posts, ditches and natural obstacles established in 1940. Stretching north from Dysart to Newburgh, it was designed to impede invading German forces if they penetrated the kingdom’s formidable first line of coastal defences. 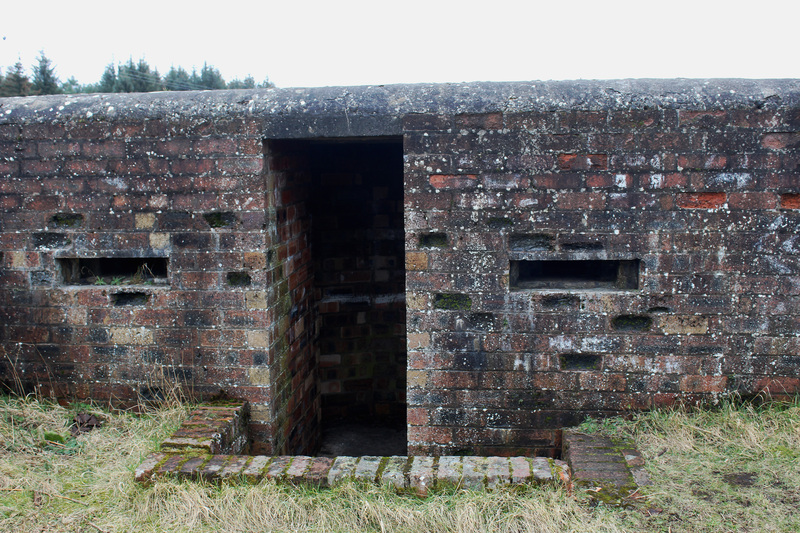 Nearby, a handful of concrete tank trap blocks sit either side of the railway and there is another similar pillbox in North Annsmuir Wood. 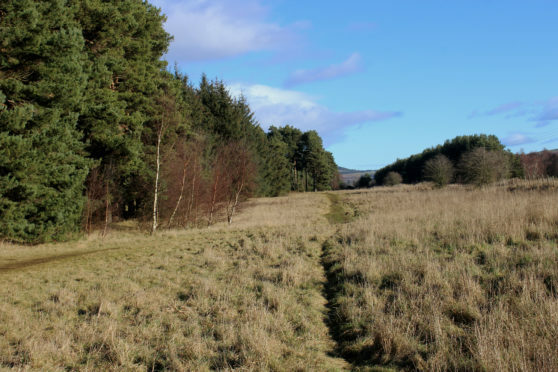 Breaching the once fortified line – which was fortunately never put to the test – I skirted along the edge of Gravelpit Wood, joining Pitlessie Road for a peaceful wander back to Ladybank. South Annsmuir, Ladybank, Fife. OS map extract. 1. Walk 500m north along Victoria Street, Victoria Road and then Golf Street. 2. Approaching house number 24, turn right down track to level crossing. Cross and bear left along path, past information board, to South Annsmuir Wood. 3. Continue ahead into plantation, staying on main path as it curves right and runs 700m north-east to T-junction. 4. Turn right and follow main path as it curves right to southern edge of plantation. 5. Emerging from trees beyond gorse-covered mound, turn left by railway sleeper embedded in ground and follow path to eastern edge of plantation. 6. Turn right and follow path then track past Sunnybraes to level crossing. 7. Cross, turn right and follow path running parallel with railway through Heggie’s Muir Wood. 8. Pass pond then pillbox and, at next junction, continue ahead, staying parallel with railway until path curves left along field edge to minor road. 9. Turn right and follow road to Ladybank.